As an accomplished studio artist, Chryssa Wolfe knows how color, scale, shapes and lines are the essence of good design. So when she began work on a new, 5,800-square-foot custom home for a significantly sloped property in DC’s Wesley Heights neighborhood, she knew she wanted natural light formations to become a part of the home’s design and character. She envisioned an interior and exterior that would flow seamlessly into each other. Large and airy interior spaces would come alive with colors, finishes and scale that would reflect her commitment to open design and expressive rooms. But before any of that could happen, Wolfe and her business partner, Jake Hanlon, would have to address the rear yard, which was nothing more than a steep hill that led to the property line. Left as it was, it would make much of Wolfe’s design vision unattainable. 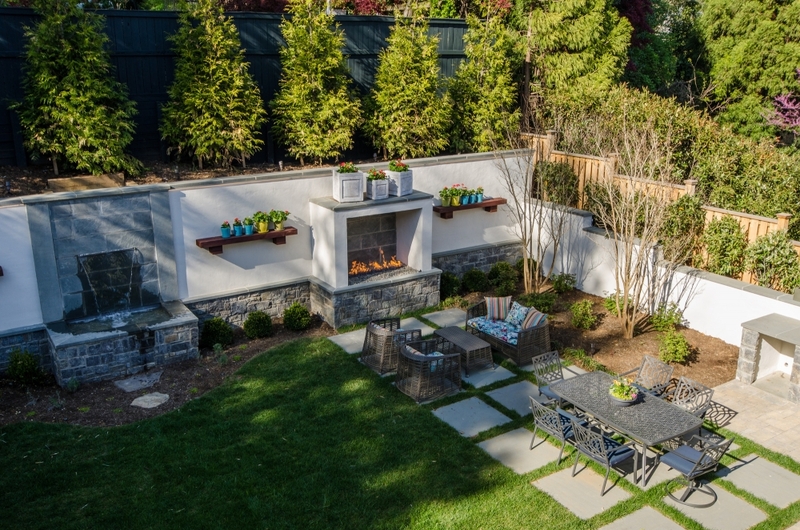 The courtyard features a 10-foot retaining wall that serves both form and function. It addresses current code requirements for storm water management, while also giving Wolfe another canvas on which to design a built-in water feature and fireplace. The courtyard also features an outdoor kitchen that is just steps away from the home’s full interior kitchen. The view from the foyer of the Wesley Heights home provides an open, perfectly centered vista into the back courtyard. “I drove Jake crazy making sure that everything was aligned exactly,” Wolfe says. The mirrored door on the left hides a richly paneled elevator which serves three of the home’s four floors. As you enter the home, nine-foot doors and windows with oversized 22×15 inch panes of glass create sight lines that bring the outside in. All of the first floor spaces flow into each other, with Wolfe paying special attention to how the kitchen would be integrated into living areas. 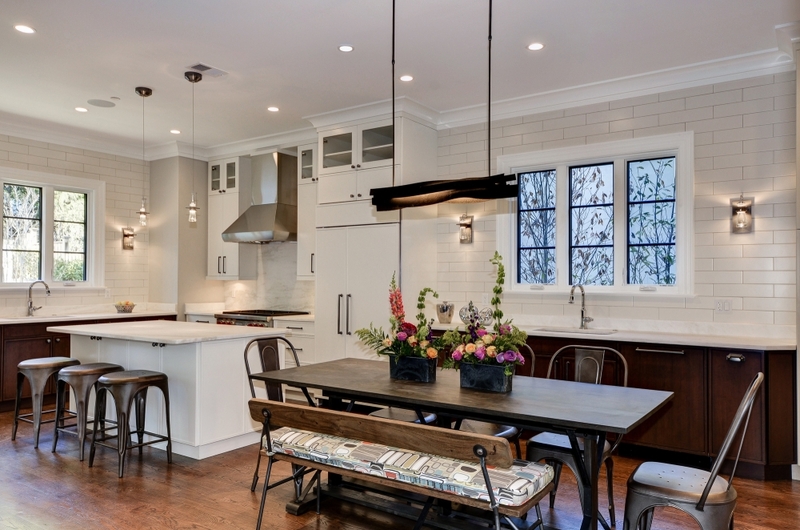 “I designed the kitchen to have two main areas,” she says. “The one area, which I call the ‘wild’ area where the messes are made, is not seen from the family room. The ‘calm’ area, where the table is, opens up to the family room and the fireplace.” The ‘calm’ area, with a small sink and extended countertops, can also serve as a wet bar for the adjacent dining room. The kitchen features Mystery White quartzite counters and a linear light fixture by Hubbardton Forge that complements the rectangular kitchen table. Wolfe designed the ‘calm’ space of the kitchen without upper cabinets, except for the corner storage, which features mirrored upper cabinets that reflect the light from surrounding rooms. The dining area features a large spherical light fixture over a table wrapped by semi-circular banquettes. The demi-lune tables were designed by Wolfe and featured beveled edges that enlarge the passable spaces around the table. Wolfe designs all the cabinetry in her homes to ensure they are constructed to her exact specifications, including the built-ins that are made by the same cabinet maker she has worked with for more than 20 years. “We understand each other really well,” she says. That’s surely a plus, since Wolfe acknowledges that she can be quite demanding. “My first interior design job was for a yacht,” she says. “So I am a firm believer that no space is too small or too narrow to make use of. Often times my team will tell me that something I want won’t fit, but I always tell them, ‘I’ll get it in there.’” That philosophy is in clear display throughout the home. With built-in bookcases in the living and family rooms as well as along one wall of the open stairwell that leads to the lower level, Wolfe demonstrates a firm commitment to making use of the home’s vertical spaces. 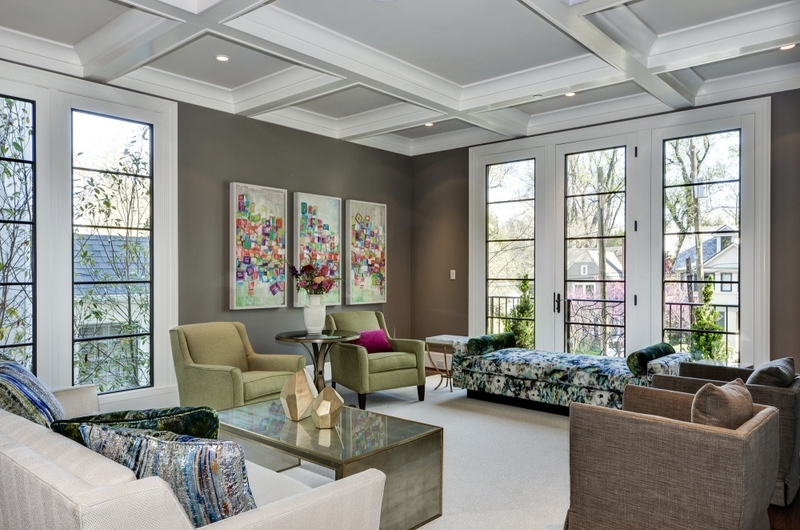 Nine-foot windows and a coffered beam ceiling create strong visual lines in the living room. The paintings on the walls are Chryssa Wolfe originals that she bequeathed to the new homeowners. 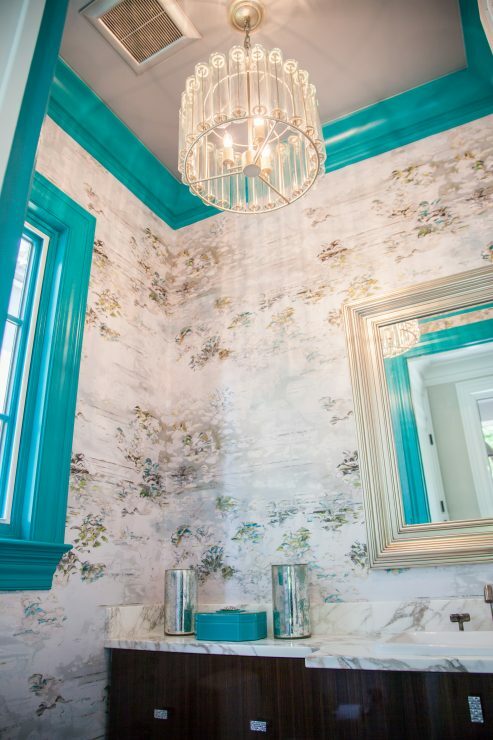 Romo wallpaper, a metallic ceiling and peacock teal high-gloss trim are just a few of the surprises awaiting those who visit the home’s first floor powder room. “Powder rooms should be a jewel,” Wolfe says, noting the she considers them to be one of the most important aspects of her designs. The open stairwell that leads to the lower level also goes up to the second floor of the home, where the master suite mirrors the same seamless flow from the interior to exterior that is found on the main level. French doors lead to a roomy balcony that overlooks the courtyard and its fountain and fireplace. “I wanted every room at the rear of the house to share the same sense of openness to the outside,” Wolfe says. Two additional bedrooms (with baths) and the laundry room round out the second floor, while the upper floor adds two more bedrooms and a bath, plus generous attic storage. Despite its expansive glass windows and large square footage spread over four floors (the lower level features a game room, wine cellar and entertaining kitchen), the home’s new owners will enjoy laughably low utility bills, thanks to geothermal heating and air conditioning systems, a hallmark of homes by Chryssa Wolfe with Hanlon Design Build.